At its meeting on November 5, 2015, the Western Standards Committee recommended new standard and guide samples for soybeans and wheat for the 2015-16 crop year, effective November 18, 2015. As well, the committee received updates on grading studies being conducted by the Canadian Grain Commission. Standard samples and standard prints previously adopted for other grades and grains will continue to be used. The committee received an update on a mildew study that the Canadian Grain Commission began in the fall of 2014. 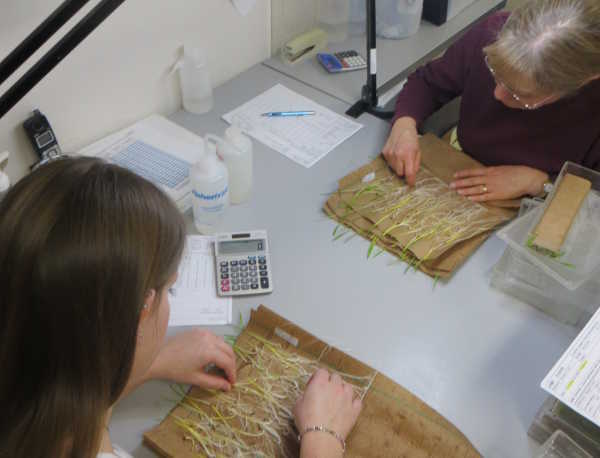 At the time, a large number of Canada Western Red Spring and Canada Western Amber Durum wheat samples had mildew damage as the main grading factor. These samples came to the Canadian Grain Commission from producers via the Harvest Sample Program. Based on study results from 2014-15, the Western Standards Committee recommended adjusting standards and guide samples to reflect more mildew. The second year of the study will determine if mildew standards and guides can be modified further. The Canadian Grain Commission will report back to the Western Standards Committee at its spring meeting. 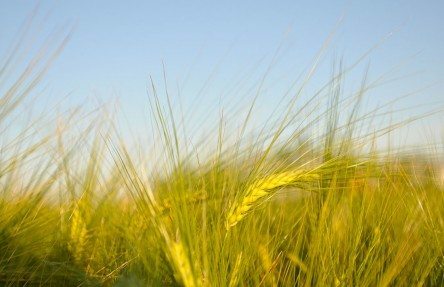 The Western Standards Committee recommended the Canadian Grain Commission pursue research into current frost damage standards and guides for Canada Western Red Spring wheat. Using samples from the 2015 Harvest Sample Program, the study will determine if current standards and guides accurately reflect the effect frost damage has on the milling performance of wheat and on bread and noodle quality. The Canadian Grain Commission will report back to the Western Standards Committee at its spring meeting. The Western Standards Committee meets twice a year to recommend specifications for grades of grain, and to select and recommend standard and guide samples to the Canadian Grain Commission. Members represent different sectors of the grain industry and include producers, grain processors, and exporters. Standard samples, standard prints and guide samples are grading tools that the Canadian Grain Commission prepares each year. Members of the Western Standards Committee examine these tools and recommend their use. Each year, as part of the Harvest Sample Program, producers send the Canadian Grain Commission samples of their crops. 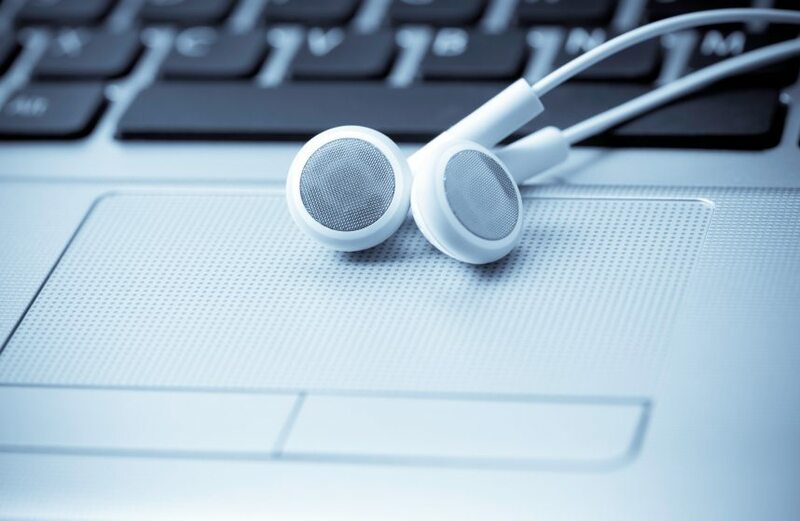 In exchange, producers receive a free grade and quality information. 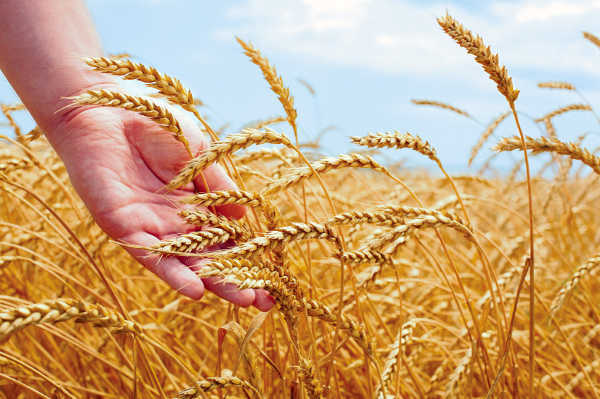 The Canadian Grain Commission uses producer samples to test the quality of the annual crop, producing crop quality data which is shared with the industry. As well, harvest samples contribute to scientific research into grading issues. We also use these samples to study end-use functionality, that is, how the physical and chemical components of grain affect the final product made from that grain. 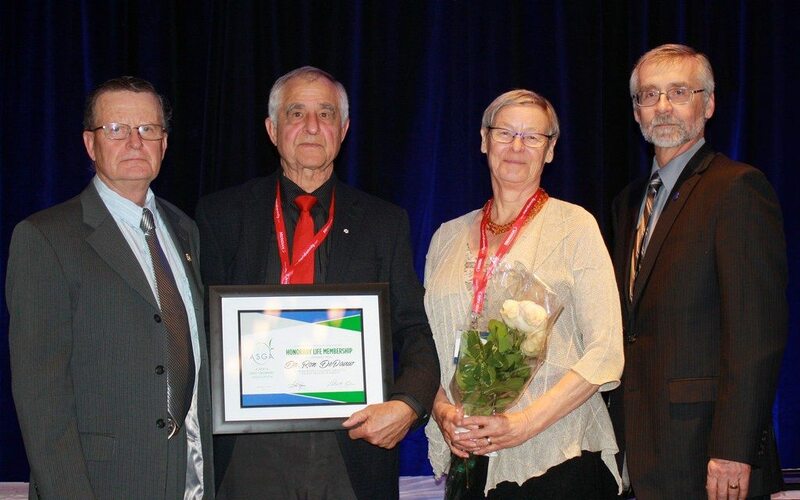 Ron DePauw received an honourary life award, in recognition of valuable service to the seed industry in Alberta. 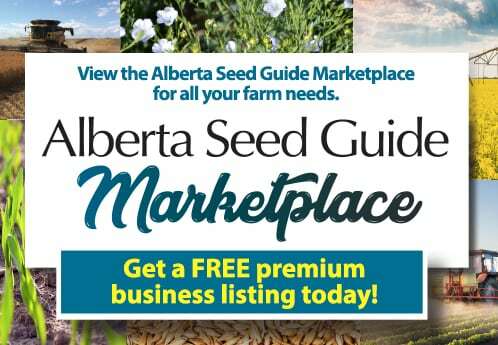 The Alberta Seed Growers Association held its annual general meeting last week, honouring several members of the seed industry. Dr. Ron DePauw andÂ Dr. Bryan Harvey received honorary life awards,Â in recognitionÂ of their valuable serviceto the seed industry in Alberta. Harvey is an internationally recognized scholar, scientist, administrator and public servant. He has taught classes in plant sciences, genetics and plant breeding at the diploma, baccalaureate and postgraduate levels. He has a special interest in curriculum development and teacher evaluation and has served on numerous committees in these areas. He developed the accreditation regime for programs in agrology managed by the Agricultural Institute of Canada and is director of accreditation for that organization. He has participated in accreditation reviews of programs at all of Canadaâ€™s agricultural universities as well as several outside of Canada. DePauwÂ has actively participated in the registration of 56 cultivars of spring wheat, durum wheat and six cultivars of triticale. His hard red spring wheat breeding program has produced cultivars with wide adaptation, shifting the negative relationship between grain yield and grain protein concentration with AC Barrie â€” setting a new standard of production; Lillian became the first solid stem wheat ever, to be the most widely grown cultivar in Canada in the Canada Western Hard Red Spring wheat market class, Carberry, a CWRS variety with resistance to numerous diseases and short strong straw, was the most widely grown cultivar in 2014. Stettler was most widely grown in Alberta for the past several years. The Bill WhitbeckÂ Outstanding Service Award was given toÂ Ward Oatway andÂ Harold WarkentinÂ in recognition of their contribution to pedigreed seed production in Canada. A seed grower since 1984, OatwayÂ farms with his wife Lori and daughters Ezri and Brie along with his parents, Grant and Lois, on the family farm south of Clive, Alberta. Together they farm approximately 1,300 acres of seed barley, wheat, peas and commercial canola. They condition the bulk of the seed on-farm, while also utilizing the local Clive Seed Cleaning Co-op. A pedigreed seed grower since 1979, Warkentin is an active contributor to the industry. In his earlier farming years he worked extensively with the Beaver County Ag Fair seed section to promote seed production, and over the years has also worked with many plant breeders to test new seed varieties. Retiring directors Larry Penner and Patrick Fabian were given special thanks for their time and service on the ASGA board of directors. With 2000 seats in the main hall, a 165â€² wide high definition video wall plus remote screens made sure that everyone had a great seat at FarmTech 2016. Alberta Canola Producers Commission director Kelly McIntyre attended last week’s FarmTech event. HeÂ offers his thoughts on the conference and all it had to offer. 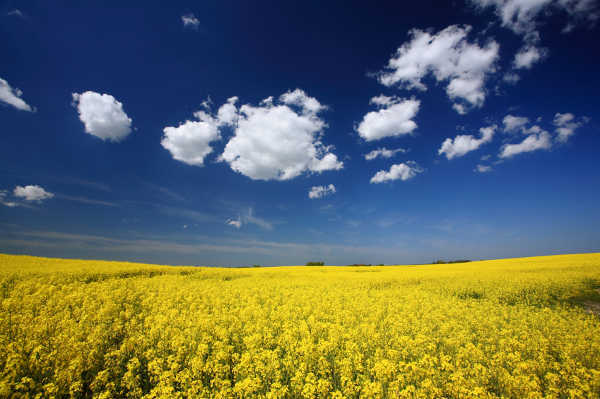 For the last five years, I have attended FarmTech as an Alberta Canola Producers Commission (ACPC) director. Prior to joining the board, I still attended almost every one as a farmer. Why? Leading edge information that helps me succeed both as a farmer and a person. The variety of presenters at FarmTech is amazing. ACPCâ€™s commitment to FarmTech helps to ensure that the commission stays connected to the farmers it serves and this yearsâ€™ experience was even more exciting to me than past ones. As a director of the Canadian Canola Growers Association (CCGA) I was asked to participate in a television interview to promote â€˜The Man Vanâ€™. This van is a portable testing facility for the early detection of prostate cancer in men. It was brought to FarmTech though the sponsorship provided by CCGA. Doing a television interview is a bit of a nerve-wracking experience for a rookie like me but I was happy to help promote such a good initiative. TheÂ Global News health segmentÂ aired that night after the first day of FarmTech. Well, as a result there were many farmers who came to the van the next day for the simple PSA blood test! There were even a few people from the city that had seen the interview and came to the FarmTech event just to get tested. I never could have imagined when I started to come to this event many years ago in Red Deer that I would be a part of such a noble cause. As the years of attending have progressed I have found that my focus has changed. I used to go to as many agronomy sessions as possible. Now I tend to go to sessions that are more about self-improvement and big picture thinking. Agronomy is still available if you want it but some of the other session topics are a little harder for a farmer to find in other places. It can be a little overwhelming having all these new ways of thinking and doing things so I try to focus on one or two new ideas and developed the skills around them. This year I attended a session called Relationship Awareness. I donâ€™t think many farmers would have actively sought out information on this subject previously, but at a conference it is easy and comfortable to attend. Good communication with many different people is a big part of a farmerâ€™s life and this session focused on improving that. I also attended a session on sustainability, which helped me to understand that it is more than just a buzz word, it is part of our entire food production system. The session on Weed Resistance in the USA made me realize the devastating effects of not paying attention to crop and chemical rotations: they are in big trouble. Plant Growth Regulators presented by a panel of farmers with some experience are emerging as a new technology available to farmers. I learned that they are sometimes very effective but not necessarily a fit for everyone or every field. The large attendance at the Managing Canola Harvest session showed me that farmers are very willing to adopt new management strategies. Overall, I will continue to attend this event in both a personal and professional capacity because it brings value to all parts of my life. As an ACPC director I enjoy the conversations I have with other growers and like seeing people enjoy an event we host. 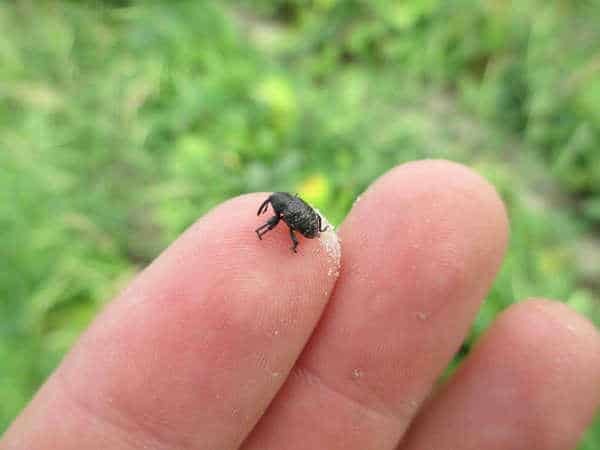 Scott Meers, insect management specialist with Alberta Agriculture, talks about pea leaf weevil. 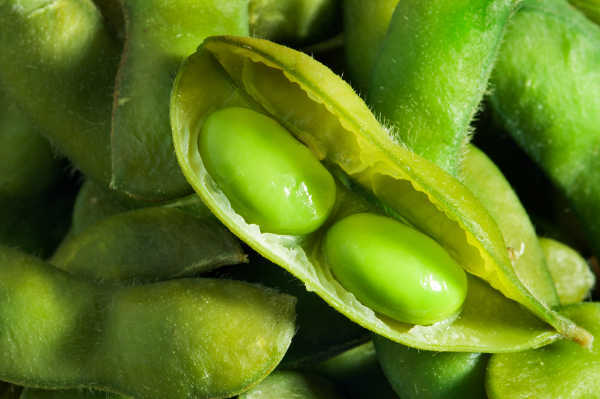 Meers says the range of this insect is expanding, adding itâ€™s also affecting fababeans. This year, hundreds of growers competed in the DeKalb Seed for Yourself Yield Challenge.Â Growers entered their DeKalb corn, canola and soybean crops and squared off with other individuals for the prestigious title of champion. In order to claim this honour, one must produce the highest yielding crop in their crop category in their respective contest zone. The 2016 insect forecastÂ mapsÂ are now available Â on Alberta Agricultureâ€™s website. Scott Meers, insect management specialist with Alberta Agriculture, gave an update at Agronomy Update in Red Deer. For wheat midge, Meers says 2016 shows an overall lower level of the insect across the province; but he says timing is everything.